Looking for a super self- catering holiday rental in Marbella, then our beautiful town house on the prestigious Golden Mile ,between Marbella and Puerto Banus,is the answer. We offer free fast fiber optic internet and cable TV .Our holiday townhouse is able to offer you a comfortable and romantic holiday. It is on Las Lomas del Marbella club pueblo which is one of the few village style complexes along the coast. The unique Pueblo is built around typical picturesque spanish Andalucian squares, with cobbled streets, whitewashed houses, Moorish wooden doors and wrought iron work. The garden and vegetation are so colorful with a hint of Africa and the exotic. The pool must be one of the most beautiful along the coast and is heated for a large part of the shoulder months. Perfect place to relax on you holiday. The Pueblo whilst it is in a perfect location for the beach,central Marbella and Puerto Banus , it is a real oasis. Also a great location to go sightseeing from, visit the Alhambra, Seville,the whitewashed villages and Ronda. bed and a twin room, both en suite. behind Marbella 15 mins drive from the house. Also the beach very close by with lots of water activities. Or if you want to eat & relax, many lovely cafes and restaurants. not just relax around our swimming pool. Our house is on a unique development in one of the most prestigious areas in Marbella, the Golden Mile. It is a Pueblo design which has won many awards. All the houses are individually designed. The Pueblo is very well maintained with wonderful gardens. The Pueblo is situated within 800 meters of the beach and the beautiful seafront promenade stretching for more than 17 km. The house is part of the Las Lomas de Marbella Club Pueblo which the College of Architects of Malaga declared it as being of architectural interest and in 2008 the Committee of Andalusia declared it to be sightseeing importance in the city of Marbella and a preservation order was placed on it , in order to protect its uniqueness. Both bathrooms are a good size and have double sinks and very good showers. The bathrooms have marble floors surfaces.We provide hair dryers. Have sky sport and all the English tv channels, together with other European channels. Our Holiday townhouse is very comfortably furnished and fully equipped and ideal for a self-catering holiday. We have put a lot of thought into making it as comfortable as possible so that you will enjoy your holiday rental. The house and the Pueblo is very andalucain in style. We mainly tend to only book Saturday-Saturday but we try and be flexible with changeover dates if it is at all possible but it is obviously more difficult at busy times of year. Whilst the house is not ideal for the infirmed as the house is on 2 floors we are able to drive the car directly to the front door which is a great advantage for unloading the car. There is ample parking . Our holidays over two weeks in this wonderful house were so restful and nice. Everything existed what we needed for feeling fine. The house is very comfortable and has lain in a wonderful arrangement. Two specific features are the terrace for the breakfast and food, as well as the marvellous pool. We come again with pleasure! We spent a very nice journey, the house is nice with an extra patio on first floor. The bedrooms are downstair, and stay fresh during summer. Good location near Marbella. The Pueblo is very nice and quiet. We appreciate the lovely swimming pool at few steps from the house. Très belle maison avec environnement magnifique ! Nous avons passé un super séjour dans cette maison située dans un "pueblo". Environnement très typique, très fleuries. La plage est proche mais d'autres plages, accessibles en voiture à env. 15 min. sont plus belles et moins fréquentées (avec sable blanc). Nous étions quatre : deux adultes et deux enfants et nous conseillons cette maison fortement pour des vacances reposantes et agréables. Nous avons profité de la piscine, propre, peu utilisée par les occupants. 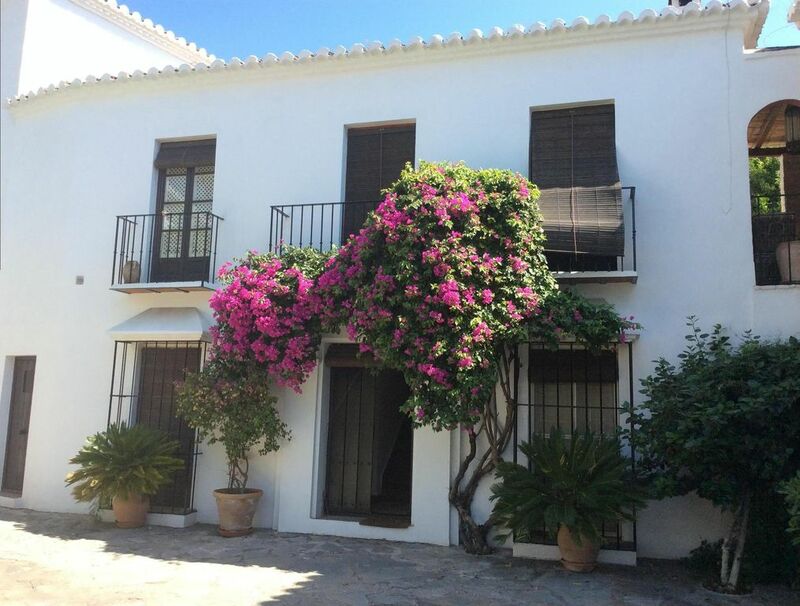 From the first time we rented this house in Las Lomas De Marbella we fell in love with the House and the Pueblo. The house is well maintained and the patio is lovely for breakfast and late dinners. We can recommend this lovely house and look forward coming back soon. The Peublo is a stunning community 10 minutes walk from the golden mile beach in between Peurto Banus and Marbella. The house is traditionally Spanish with large bedrooms, two bathrooms, lounge, dining area, fully equipped kitchen and lovely outside space. I just wanted to say we had a fabulous time in your beautiful house, it far exceeded our expectations. The photos on the web site do not do it justice. Hopefully we will be back again next year, we are also a lot fitter having walked miles. Many thanks Janet for taking time out to write a review. We are so pleased you enjoyed your stay in our house. The house is a difficult one to take photos of- we will have another go.Hope to hear from you again. All the best and thanks for booking with us. The Pueblo is on the Golden Mile, perfectly situated for Marbella and Puerto Banus, world famous premier destinations , both within 5 minutes drive. The beach is a mere 10 minutes walk away to the Maritimo Walkway along which you can walk into Marbella old town and the famous Orange Square and to Puerto Banus. Malaga airport is 35 minutes drive or Gibraltar airport 45 minutes. Within 2.5 hours you can visit all the world famous beautiful Andalucian cities of Seville , Cadiz, Cordoba and the Alhambra in Granada You can even go skiing in the Sierra Nevada within 2.5 hours drive. We are also surrounded by the romantic white washed andalucian villages, the nearest is 15 minutes away and the well known roman town of Ronda 80 kms away. You could visit a different beach every day, miles of beaches close by or you can visit the Costa Luz at Tarifa within 1.5 hours where windsurfing and kite surfing are very popular. We are also surrounded by national parks and beautiful walking countryside. Ski: From the house you can drive 2.5 hours to the ski resort in the Sierra Nevada. You could easily go for the day. An easy drive and a very user friendly resort. You could be on the slopes by 11am and enjoy the sunshine. Skiing at over 3000meters. For the non skiers in the party they could visit the Alhambra Palace nearby in Granada. Booking Conditions: 25% is payable at the time of booking ( no refundable) and the balance is payable 6 weeks before arrival. Holiday cancellation insurance is recommended.